maybe you have already noticed that your iPad can charge not only while plugged into a special charger, but also while connected to an iPhone charger or to your Mac or PC via a USB cable. Some methods are more effective, and some of them are a bit slower, but sometimes some of them can alert you about errors saying that iPad is not charging. Usually, it can occur when you connect your iPad to a Mac or a PC via a USB cable. However, this can take place when you plug an iPhone charging cable into your iPad. The reasons for not charging your iPad can be different, however, there are common ones. For example, the most widespread reason is a power source itself. But this is not the only one. I will tell you about all the possible causes for not charging an iPad. In this article, you will find the information on fixing possible issues. Firstly, before getting to other causes (with chargers and so on), check the iPad port itself for any debris, dust, lint, gunk and other possible obstructions. Pick up a plastic or wooden toothpick and clean the port of your iPad to ensure that nothing is stuck there. Maybe it can sound a bit silly to you, but finding some trash in iPad's charging port is possible enough, especially if you carry it in your bag without any additional coverage. Using an iPad by kids can cause the same effect, as they don't treat things accurately as usually. So, some stuff can be stuck in a charging port. It can be anything from food particles to little rocks or dirt. They would prevent your iPad from charging, and should be cleaned out. While iPhones suffer from this cause more often, iPad could face the same problem too. So, before looking for a problem in other places, check the charging port and endure that nothing is stuck there. Often I see the 'Not charging' alert on my iPad while I plug it into a certain port on my Mac. I can explain this by the fact that some ports don't give an iPad sufficient power for the proper charging. That's why it can lose energy while being plugged into a computer via a USB cable. Try to connect your iPad to another USB port. Check whether other ports are more powerful. Try to use a different cable, it may be the cause for problems as well. In case you don't have another Lightning cable, get it from Amazon or borrow from a friend. Note, that if your USB cable is damaged (torn, frayed, and so on), better purchase a new one. Such cable can be unreliable and cause you problems. I recommend you getting a certified cable from Apple. However, there are always third-party solutions for a lower price, but be careful with them, as they may be not of high quality and some of them even don't work at all. Doing that may be effective, if the reason lays in a port or in a cable, but it not always the only solution. So, let's get to more details. Insufficient power is the most common issue for seeing the 'Not Chargng' message. So, pick up the original iPad wall charger and try how it works. 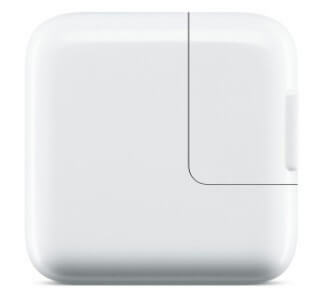 it looks like a square block and is the most efficient option for charging your iPad. Note that it should be a 12w charger for iPad, not a 5w one for iPhone. The last one will charge your tablet, but the whole process may take much more time. It is so, because its power output is less. I bet you have already noticed the difference of 12w and 5w. You might even notice that if you plug an iPhone charger into your iPad and launch some power-consuming app, it may still eat the battery resources instead of growing them. That's why using a powerful 12w charger is ideal solution for every iPad in the world. If you have lost your iPad charger and use iPhone one for this reason, better think of getting a new 12w charger. It will be better for your Apple device and for you too, as you won't need to wait for ages until an iPad charges from a USB port or an iPhone charger. These 3 main tips may solve your charging problem. I hope you won't see a message saying 'Not Charging' at the iPad top again. Try all of them one by one and please share in the comment which ways worked.